We’re delighted to have just signed off on Helen Watson’s new web site. Helen’s one of the country’s finest jazz-blues singers with a back catalogue and track record to match the very best. She tours as a solo act, part of a duo and with both Burden of Paradise and The Lovenotes. 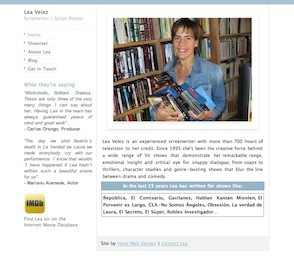 She wanted a site that showcased her music and the ability to update gigs herself using a simple content management system. We added a carousel effect on the Music page that helps us fit more content into a smaller area without things feeling cramped; we also used a natty MP3 player for the music samples. 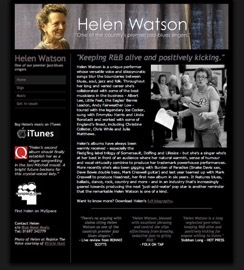 Helen Watson’s web site. 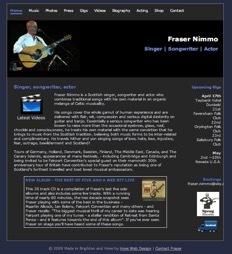 Here’s a new site we’ve just built for Fraser Nimmo, a Scottish singer, songwriter and actor. Fraser was keen to update his old web site with something more contemporary that he could use to promote his live appearances, sell CDs and generally keep fans - and promoters - in touch with what he’s up to. 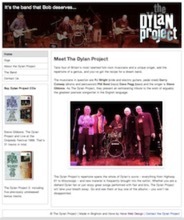 The launch of the site was time to coincide with the release of Fraser’s new CD - The Best of Five and a Wee Bit Live. The site incorporates a couple of nice, simple features - a shopping cart that works with PayPal and a music player which lets visitors hear snippets from Fraser’s last two albums.